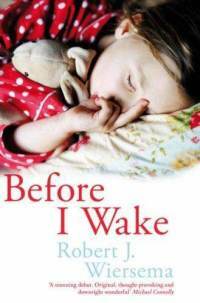 Before I Wake from Canadian author Robert J. Wiersema is a story about young Sherry, a 3 year old girl who is seriously injured when she is involved in a hit and run accident on a traffic crossing by a pickup truck driver. Sherry's parents Karen and Simon Barrett face their worst fears when their only child won't wake from her coma and unfortunately their marriage fractures under the pressure. Karen takes Sherry home, hires a nurse and settles into a steady routine with daily visits from Simon. The plot really starts to pick up pace when Sherry's nurse Ruth begins to suspect that Sherry has had a role in curing the painful arthritis in her hands. Ruth's sister is dying of cancer so she brings her to Sherry's bedside and places the comatose little girl's hand on her chest in an attempt to heal her. Before long, news crews, journalists and pilgrims are outside the front of Karen's house asking for statements about the reported miracle healings and asking to see Sherry. However, along with them come religious protestors led by a shadowy figure, Father Peter who claims Sherry is a false idol. He threatens the Barrett family and is never far away when bad things start to happen. Father Peter travels all around the world, following reports of miracle healings, and shuts them down by whatever needs necessary. Father Peter believes he's doing God's work and clearing the way for the return of Jesus. However as one character put it, "how do you know you haven't already met Him?" Wiersema has given us an interesting look here at religion, in terms of the Church, faith and miracles. Meanwhile the driver of the truck is consumed with guilt, but when he decides to take his own life, he jumps from a cliff only to find a mysterious hand pulling him back. The driver finds himself living in the 'in between' and must find himself and his purpose. I enjoyed the supernatural/fantasy element to this novel and the so-called true identities of the truck driver's mentor Tim, and Father Peter. Before I Wake isn't a sunny, bright story. This is a 'what would you do' story, and a thought provoking tale that makes you think about bigger issues. I especially liked the identity twist and the men living in the 'in between' at the library. I was really curious to know their stories and to be left wanting more at the end of a book is certainly the mark of a great read. I enjoyed it very much and thanks for giving it to me to read, it was a gem I wouldn't have discovered otherwise.